Yarrow Road: Cycle routes have recently been created from Old Wareham Road to Mannings Heath Road. These consist of a combination of on-road cycle lanes and shared footways for pedestrians and cyclists. Hatch Pond signals: Starting in early February, the Hatch Pond signals at Waterloo Road / Cabot Lane will be upgraded as they are outdated and have physically deteriorated. The junction has the largest number of signals of any in the borough and is on a key strategic route to the Port of Poole. 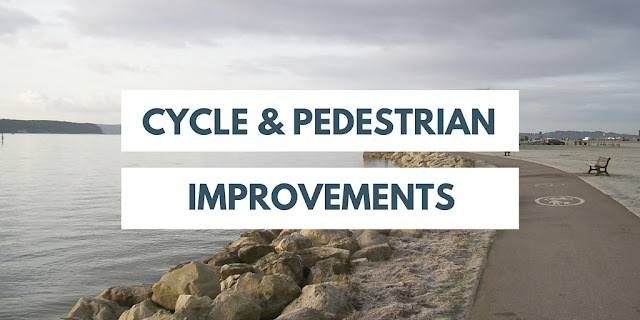 Improvements include ultra low voltage LED lights, upgrading all crossings to Toucan crossings for pedestrians and cyclists, new tactile paving and additional new crossings on the northern side of the junction, near to Parkstone Grammar. The Toucan crossing facilities will link existing cycle lanes on Cabot Lane and Waterloo Road. To complete these works in around 11 weeks, access and egress to and from Hatchpond Road and Cabot Lane will be limited to left turns only during the works. Diversions will be in place. Newfoundland Drive: A new cycle path has been created alongside Baiter skate park to link Newfoundland Drive with the footpath and cycleway in Harbourside Park, linking to Cycle Route No 25. Hamworthy Park: Following the completion of the Hamworthy rail crossing the existing gravel track approach, as shown in the image, is being widened and tarmacked to create a new shared foot/cycleway, connecting the park with providing a traffic-free link from Lulworth Avenue to Shapwick Road. New rail crossing is open: Local residents in Hamworthy have welcomed the new cycle and pedestrian crossing which provides easy and safe access from the Harbour Reach development over the railway tracks to Hamworthy Park. The Mayor of Poole marked the official opening on 22 December 2015 by cutting a ribbon before leading local residents across the bridge.